A recipe from my nani feels like a fragile thing, like the first blooms of spring. When I graduated from college in 2000, my maternal grandparents came all the way to the United States from Calcutta. Just six years later, nani and nana decided that they couldn’t travel to my wedding in Jamaica. I was startled by their decision. It was an admission of fatigue that seemed too precipitate. When I brought my one-year old baby home to Calcutta two summers after that, my nani fell gravely ill. It occurred to me, again with startling force, that the pale person in the hospital bed could be here this minute and not tomorrow. Mortal. It was an ugly and humbling word. New motherhood had suddenly closed the circle of family and maternal love for me. I needed my nani’s gentle words, her explanations of things. She seemed to intuitively understand the overwhelming demands on my time along with the equally overwhelming affection that I felt for my new infant. 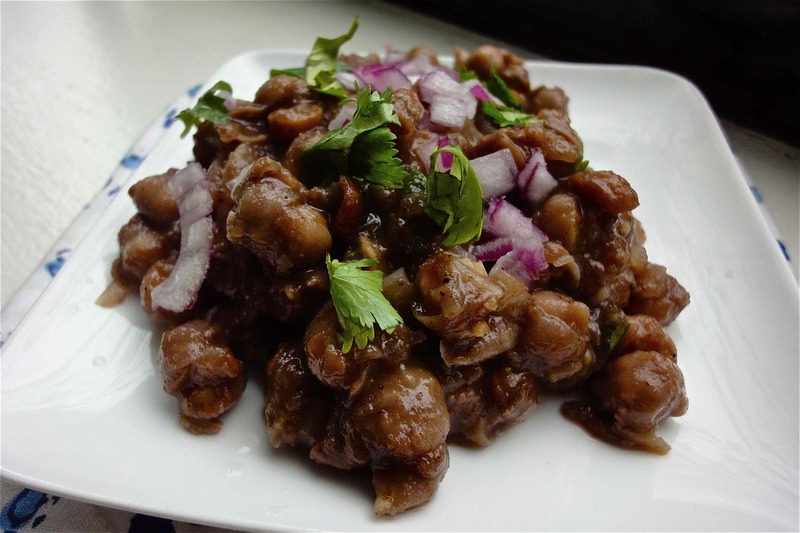 This is a typical North Indian chole or chickpea dish, flavored with tamarind extract and pomegranate seeds. It uses freshly ground chole masala, along with whole spices, a tea bag and a pinch of soda while pressure cooking. It’s spicy and tangy, and excellent for dishes like chole bhatura or aloo tikki with chole. note: when adding the tamarind extract at the end, add it spoon by spoon, tasting along the way. You might need less or more of it depending upon how sour the tomatoes and pomegranate seeds in the dish are. 1. Pressure cook the soaked chickpeas with the tea bag, cinnamon stick, cardamom, baking soda and salt, and enough water such that it covers a half inch over the top of the chickpeas. When cooked, the chickpeas should mash easily between the fingertips. Remove the flavor ingredients, and keep aside with the cooking water. 2. Prepare the chole masala spices by dry roasting the spices on a hot pan until they release an aroma. Grind to a powder and keep aside. 3. Meanwhile heat the oil, and add the tarka spices. After the cumin sputters, add the onions and cook until the onions turn golden brown. Nani’s tip: add a sprinkle of sugar to hasten the browning. Add the garlic and ginger, and cook for a few seconds until they become aromatic. Now add the tomato and cook for several minutes until the oil glistens separately. 4. Add the boiled chickpeas. Now, add the reserved water slowly as you cook, a 1/2 cup at a time, waiting until it integrates with the cooked paste. As you do this, add the toasted and ground chole masala spices. Strain the tamarind extract and add a couple of tablespoons of it at first. Stir and cook for a few seconds and taste. If needed add more tamarind extract. Add salt to taste. Bring to a low boil and simmer for about ten to fifteen minutes. 5. Garnish with cilantro and finely chopped red onions to serve. I know what you mean – I still jealously guard the last batch of rasam powder my grandmom gave me in 2009, because she passed on a month after I came back to the US. I know my mom has her recipe now, but it is not quite the same.